The ARISTO E Cigar is wildly known as the Best E Cigar available to buy in N.America. ZEROCIG was among the first companies to launch an electronic cigar to their product offering, but was the 1st to offer the Best High Quality E Cigar! The ARISTO Electronic Cigar is a fully rechargeable e cigar which includes two Cuban Refills. Each refill can expect to provide 1500-1000 puffs of exquisite Cuban cigar flavor. Not only does the ARISTO E Cigar produce clouds of vapor, but it delivers a very realistic cigar experience. 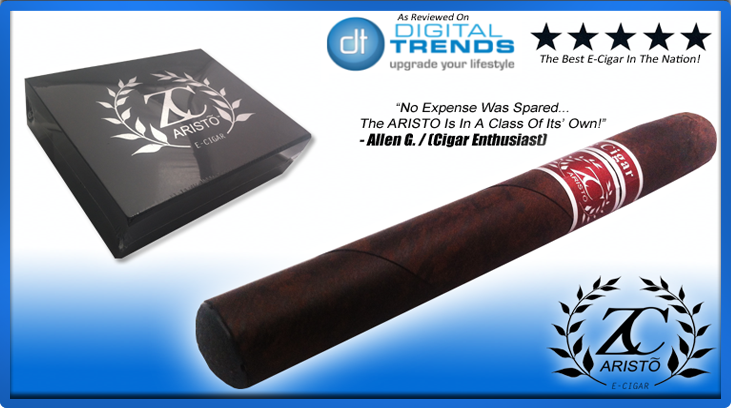 The ARISTO E Cigar is available for a very affordable price of $69.99. Thousands of Cigar smokers have made the ARISTO E Cigar the best Electronic Cigar available today. Read and understand all lithium battery warnings, proper usage and liability waiver.